(a) For the purpose of this agreement “the Agency” and “the Client” shall where the context so admits include their respective assignees, sub-licensees and successor in title. In cases where the Photographer’s Client is a direct Client (i.e. with no Agency or intermediary), all references in this agreement to both “the Agency “ and “the Client” shall be interpreted as references to the Photographer’s Client. (b) For the purpose of this agreement “The Photographer” will mean the Author of the Photograph or Bruce Allinson. And shall where the context so admits include their respective assignees, sub-licensees and successor in title. (c) “Photographs” and “Works” means all photographic material furnished by the Photographer, whether transparencies, negatives, prints, digital files or any other type of physical or electronic material in existence now or yet to be processed. (d) All contracts verbal or written are only accepted on the basis that the Terms and Conditions of the Photographer are the only ones applicable. (e) Other Terms and Conditions proffered by the Client are specifically excluded unless agreed in writing beforehand by the Photographer. (f) Where time is of the essence the Photographer entirely at their own discretion may accept an instruction given orally, in this event the Photographer shall accept no liability for any error in executing the order. (g) Unless the Photographer is given prior written notice by the Client, the person placing or signing the order on behalf of the Client is deemed to be authorised to do so. (h) When a Client’s policy is not to rely on email confirmations, hardcopy paperwork must be supplied, if none is provided, then the email traffic will constitute a contract in law. (a) Unless agreed to in writing on the License to Use (and/or the Invoice or written communications during negotiations) no exclusivity is given or implied to The Agency and/or The Client. (b) The Photographer retains the right in all cases to use or sell the Photographs. (c) Exclusivity will not be unreasonably withheld but only on written agreement with the Photographer before work commences. (d) Unless specifically asked for and outlined in writing Exclusivity will only apply to third parties and will not apply to the photographers own use for their portfolio and marketing of their own business. (a) It is the Client who must satisfy himself/herself/It’s self that all necessary rights, model releases, clearances or consents which may be required for reproduction of people, places or items depicted within any Works are obtained. (b) It is acknowledged that the Photographer gives no warranty or undertaking that any such rights, releases or consents are or will be obtained whether in relation to the use of names, people, trade marks, registered or copyright designs or Works of art depicted in any picture. (c) In all cases the Client shall indemnify the Photographer against all expenses, damages, claims and legal costs arising out of any failure to obtain such clearances. (d) The Photographer will not be liable for any loss or damage, for any consequential loss of profit or income however caused including negligence by the Photographer, Allinson’s Photography, Bruce Allinson, their employees or agents or otherwise, and it is the Client’s responsibility to insure against such loss or damage. (a) Payment by the Client will be strictly within 15 days of the issue of the relevant invoice for the commissioned work. (b) Thereafter, further charges may be made for any additional statement, letter (whether as an email, fax, etc) issued for the recovery of the outstanding debt of not less than £15.50 plus VAT each and all other costs for the recovery of debts including bank charges. (c) A further charge of 5% over the Lloyds TSB Bank rate from time to time is added to the invoice on the first day following that when settlement should have been made. LATE PAYMENT OF COMMERCIAL DEBTS (INTEREST) ACT 1998 will be enforced. (d) Where a Client is a company and whether or not that company has gone into liquidation the individual directors will be responsible for all outstanding fees and costs in relation to the contract. (a) Any work that requires the photographer to work unsocial hours, or be of such urgency that other work needs to be postponed or the photographer needs to work outside of usual office hours to deliver the work within the clients specific deadline will be subjected to an additional charge of up to 50% of the original quotation or estimate unless otherwise agreed in writing or as part of the original contract with the client. (b) A rush fee can also be applied when the need to process the photographs or digital files also requires urgency resulting the need for the photographer to work outside of office hours or postpone other work to meet a clients delivery deadline. 13. RIGHT TO A CREDIT. (a) The Licence to Use requires that the Photographer’s name ‘AllinsonsPhotography.co.uk’ will be printed on or in reasonable proximity to all published reproductions of the Photograph(s). The Photographer also asserts his/her statutory and moral right to be identified in the circumstances set out in Sections 77-79 of the Copyright, Designs and Patents Act 1988 or any amendment or re-enactment thereof. 16.1 During the course of our activities we, Allinson’s Photography, will process personal data (which may be held on paper, electronically, or otherwise) about our customers and we recognise the need to treat it in an appropriate and lawful manner, in accordance with the Data Protection Act 1998 (DPA) and the General Data Protection Regulations (GDPR). The purpose of this notice is to make you aware of how we will handle your personal data. 16.2 This notice may be amended at any time. 16.3 This notice applies to all customers of Allinson’s Photography. 17.2 “Personal data” means recorded information we hold about you from which you can be identified. It may include contact details, other personal information, photographs which are linked in some way with personal identifiers, expressions of opinion about you or indications as to our intentions about you. “Processing” means doing anything with the data, such as accessing, disclosing, destroying or using the data in any way. 18.1 We will usually only process your personal data for the legitimate interest of the provision of customer services. With your consent, your data may also be used for marketing purposes related to Allinson’s Photography. We will not keep your personal data for longer than is necessary for the purpose. This means that, unless you have provided your consent to continue to receive marketing material from Allinson’s Photography, your data will be destroyed or erased from our systems when it is no longer required. Most customer data, other than data that we are required to retain for legal reasons, will be destroyed after a period of 48 months following completion of our services to you. Any data that we are legally required to retain will be destroyed within 6 months of that legal obligation ceasing to apply. You may withdraw your consent to the use of your data for marketing purposes at any time. Any member data used for that purpose will be destroyed within 7 days of notification of withdrawal of such consent. (b) Prevent the processing of your data for direct-marketing purposes. (c) Ask to have inaccurate data held about you amended. (d) Prevent processing that is likely to cause unwarranted substantial damage or distress to you or anyone else. (e) Object to any decision that significantly affects you being taken solely by a computer or other automated process. 25.1 We will ensure that appropriate measures are taken against unlawful or unauthorised processing of personal data, and against the accidental loss of, or damage to, personal data. 25.2 We have in place procedures and technologies to maintain the security of all personal data from the point of collection to the point of destruction. We will only transfer personal data to a third party if he agrees to comply with those procedures and policies, or if he puts in place adequate measures himself. 25.3 Maintaining data security means guaranteeing the confidentiality, integrity and availability (for authorised purposes) of the personal data. Please note that our services for you may require us to pass on such information to third parties such as BIPP. We may also give such information to others who perform services for us, such as IT consultants. Our business may be audited or checked by our accountants, or by other professional bodies/organisations. We do not normally copy such information to anyone outside the European Economic Area. All such third parties are required to maintain confidentiality in relation to your personal data. If you wish to know what personal data we hold about you, you must make the request in writing to MR Bruce Allinson LBIPP, EP. 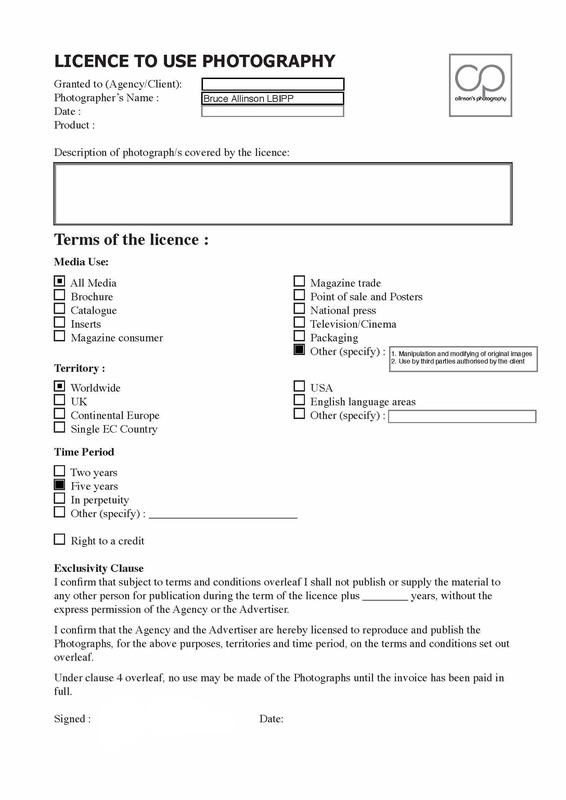 This example with the relevant check boxes filled in is our Standard Licence Agreement applied to all photography unless otherwise specified.